My grandma put together my parents’ wedding album. She was scrapbooking long before there was a name for it. The first photo on the first page is a road covered with flood water. It’s not that there was a flood on their wedding day; thank goodness. It’s because they first met during a flood and my grandma decided to start the album with a flashback. Apart from proving that my grandma needs a Pinterest account; this also proves that thinking through different wedding photo ideas can really pay off. 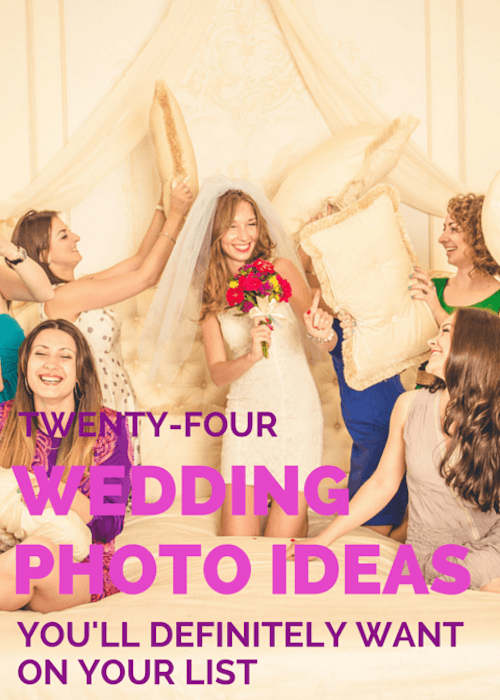 While I am still yet to find a wedding photo featuring flood waters, here are 24 brilliant ideas you’ll definitely want on your list. These photos beg to be noticed. Among all the wonder, emotion and stress of the day it’s good to remember to have a bit of fun. How could you not enjoy yourself while whacking your bridesmaids with a pillow? 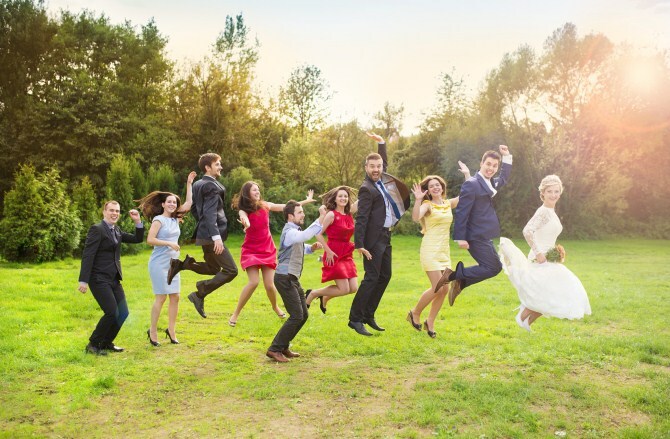 And I love this photo of the wedding party jumping into the air. I have to admit I’ve been asked to jump in a wedding photo before and I was never particularly excited by the idea. But when I saw this photo it suddenly made sense to me. Looking at this shot I can see that the key to success is the fact that the wedding party have given themselves lots of room to move and are not just a line of people who happen to be five centimetres off the ground. If you want to go from jumping to running then this relaxed shot of a wedding party crossing a bridge is perfect inspiration. Fun aside, weddings are about celebrating something – your love for each other. So, how do you capture that look, that smile, and all the tender little moments? These photographs show a real eye for detail and are full of great ideas to capture the things that make it not just a wedding; but your wedding. When planning your photoshoot, don’t forget that great photos – like this stunning shot of a bride being laced into her dress – can happen at many different times during the day. Think beyond things at the ceremony or immediately afterwards and you’ll get something really special. 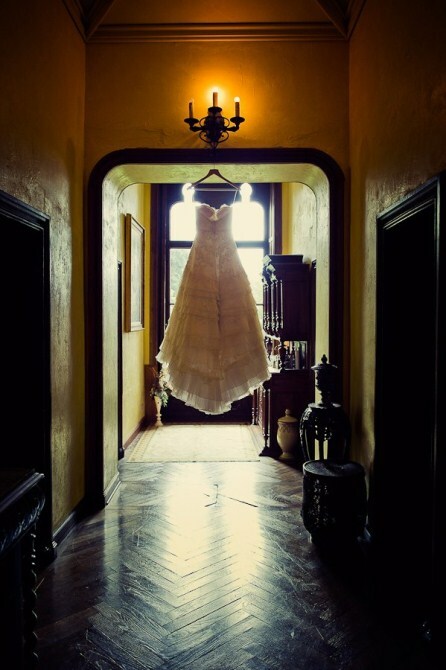 One of the most anticipated moments in a wedding is the first appearance of a bride. 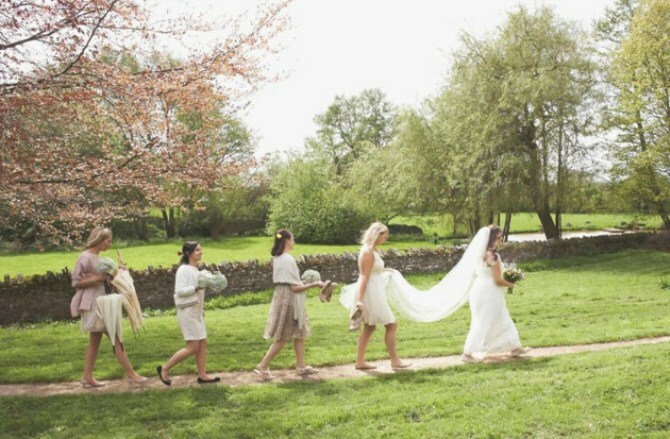 But this shot from Outreachr.com has captured a moment before the bridal party reach their friends and family. I love the practical bridesmaid who’s taken her shoes off. I wish I’d done that the day I was a bridesmaid! 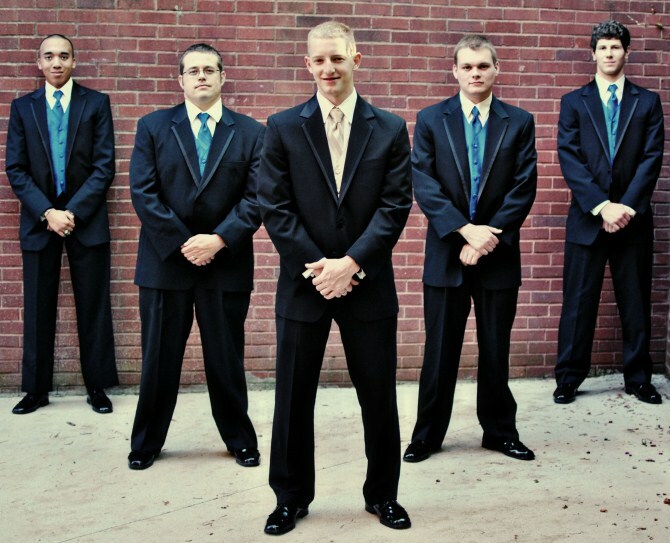 While we’re on the subject of wedding day back-up, look at these amazing groomsmen from Ashley Campbell Photography! Nothing’s going to get past that protective formation. Don’t forget the smaller members of your wedding party either – this bride playing with her flower-girl is super sweet. Of course the most important shots are those capturing your love as a couple. But what should they look like? I deliberately didn’t include a photo of a couple kissing. I figure if you’re reading this blog you’ve probably got that one covered. 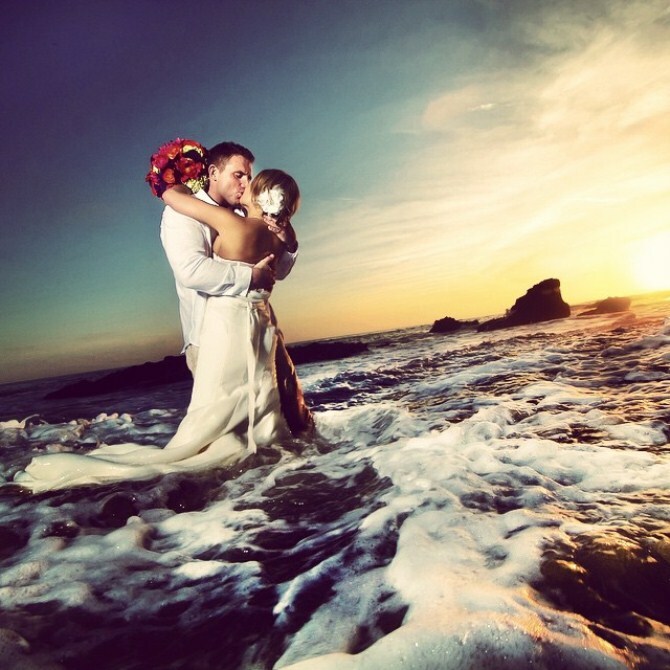 But if you’re having a sunset wedding you’re definitely going to want to add this to your wedding photo ideas. It’s a fantastic understated moment – a ball of light sinking to the horizon. So different to the whole of sky sunset we usually try to capture. 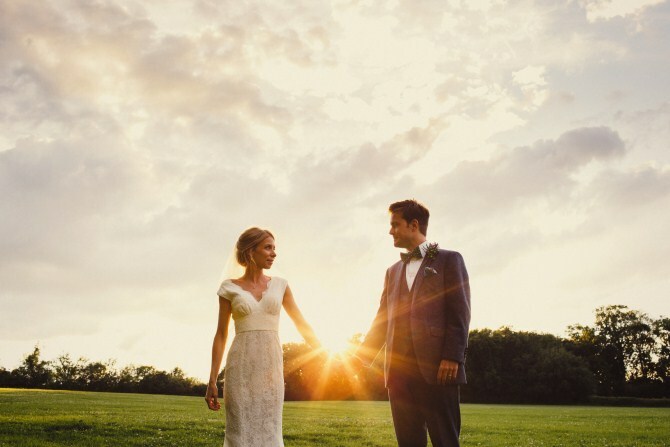 I’m in awe of how photographer John Hope has managed to place the couple in the perfect spot so they seem to be holding the sun. What’s that? You’re not having a sunset wedding? What about this amazing shot of a couple lying down then? 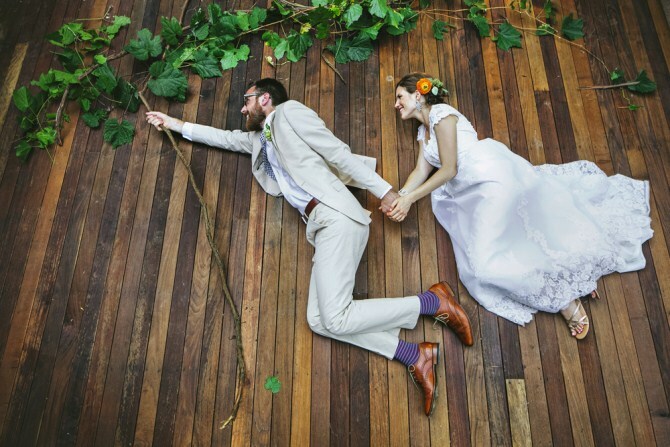 The wood on the dock makes a great contrast to their beautiful clothes. 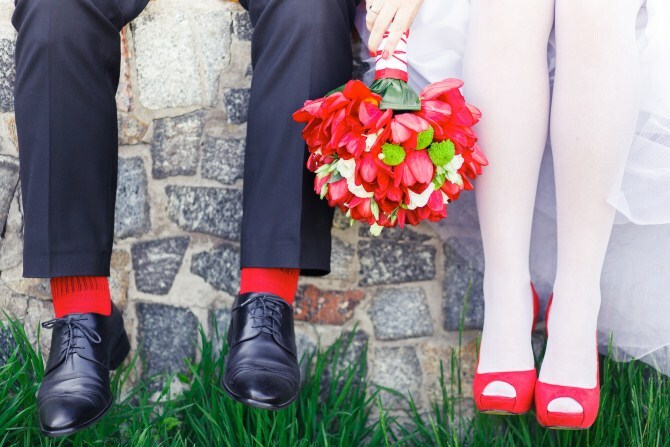 Chances are you put a lot of time and effort into choosing clothes, shoes, rings and flowers for your wedding. And all that effort should definitely be preserved for future enjoyment. These photos capture objects just beautifully. Consider displaying objects in unexpected ways. The bouquet upside down, the dress hanging in the hallway or the rings in handprints in the sand, for example. 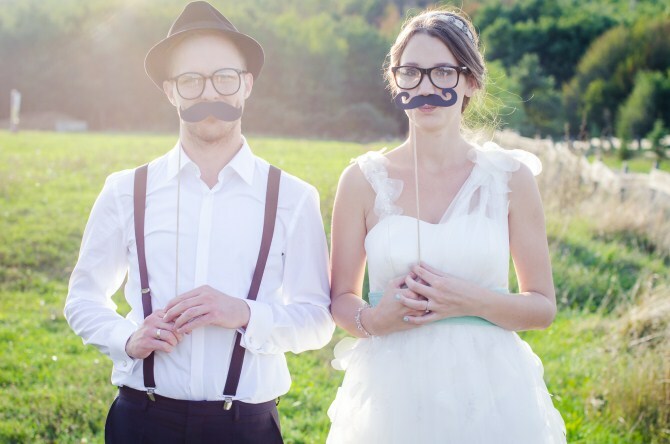 Of course you may also have props from a photo booth available – like this couple with the matching moustaches. 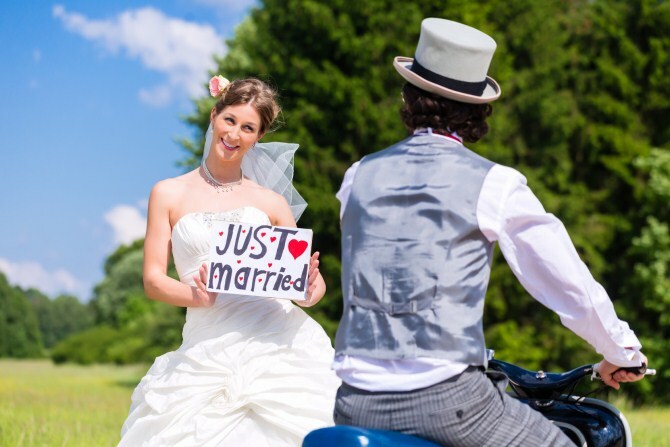 Maybe 3D versions of the word ‘love’ or a ‘just married’ sign are more your style, but if you have props definitely use them. 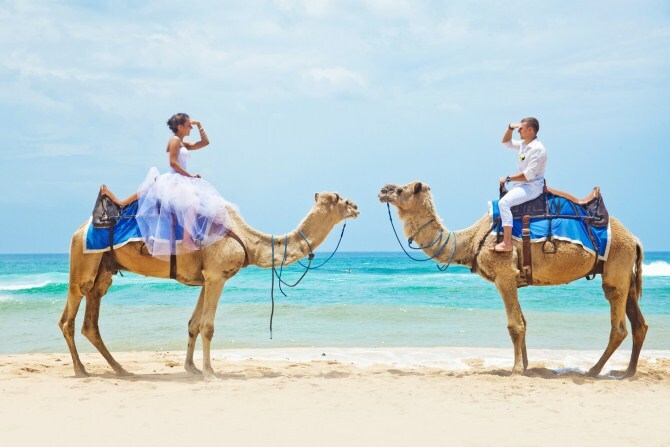 If you’re lucky enough to have an animal at your ceremony then you’ll get amazing shots, like this gorgeous couple on top of a spectacular camel. Some of you out there will be thinking, hang on, we were just talking about a camel – how much wilder can it get? 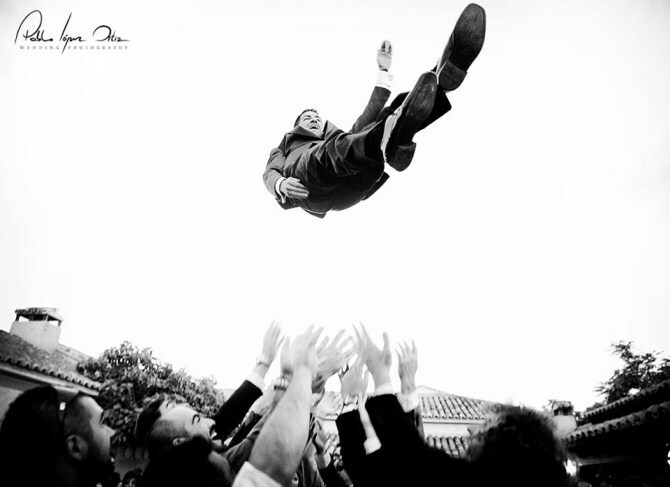 Well, if the groom is a daredevil – why not take a tip from photographer Pablo Lopez Ortiz and throw the groom! If you’re looking for something slightly less daring then you might want to try jumping in the pool. 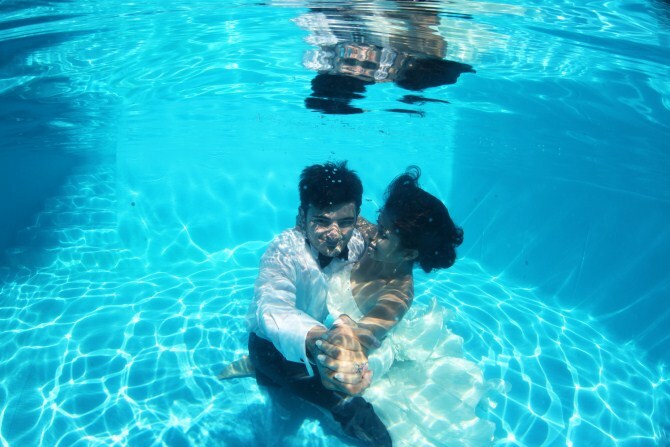 If you don’t have an underwater camera available then check out this couple wading into the ocean. The experts at Bumatay Studio did a great job capturing them. If you’re thinking that this all sounds a bit cold, or like a bit too much hard work then don’t panic. Your photographer can help. 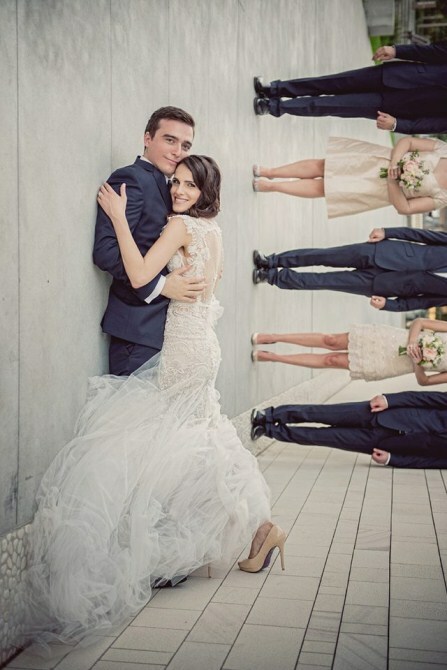 There are a bunch of great photography ideas out there including this couple, who look like they are striding out on an adventure but are in fact lying down, and the mindblowing shot from Don’t Say Cheese where the couple seem to be dancing up the wall. Some of the easiest and best ideas use the magic of Photoshop. 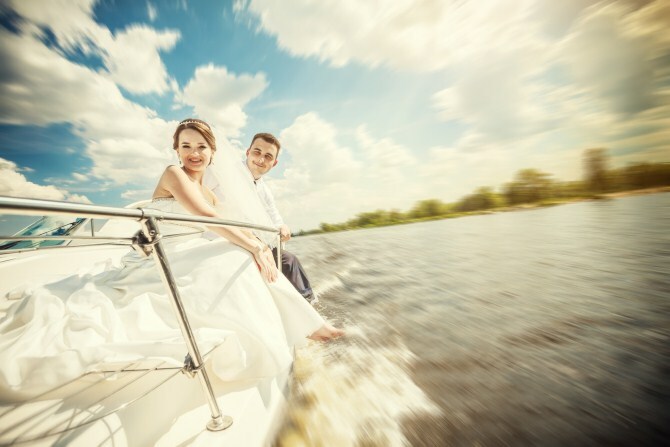 See how the couple on the boat have added a bit of blur to capture the idea of how fast they are traveling? And my personal favourite is the shot with pyrotechnics. 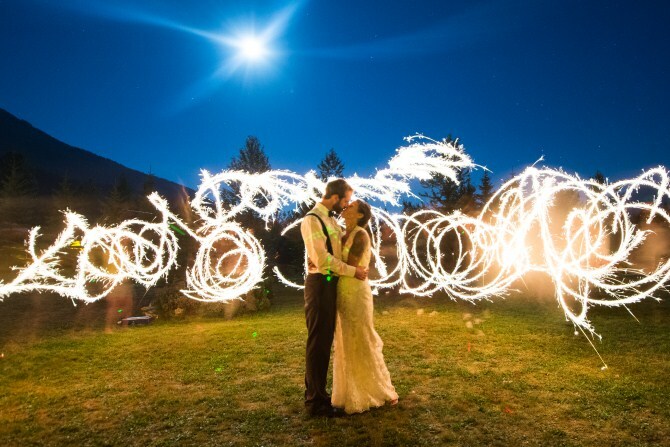 Nothing tops pyrotechnics at a wedding! Hopefully your brain is now brimming with wedding photo ideas. But don’t call your photographer yet, because I have one more tip for you. 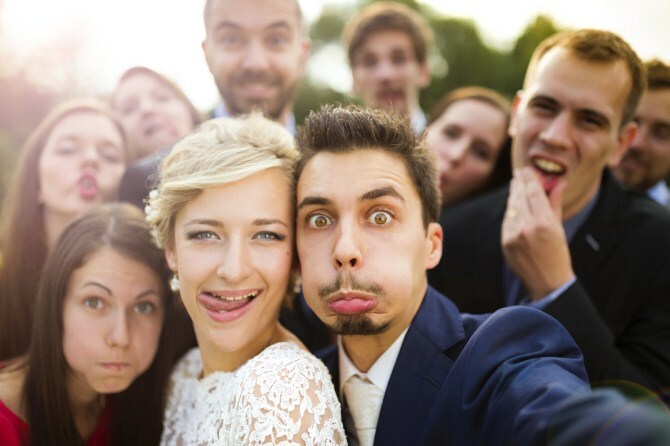 Don’t let your wedding photos sit in a drawer! 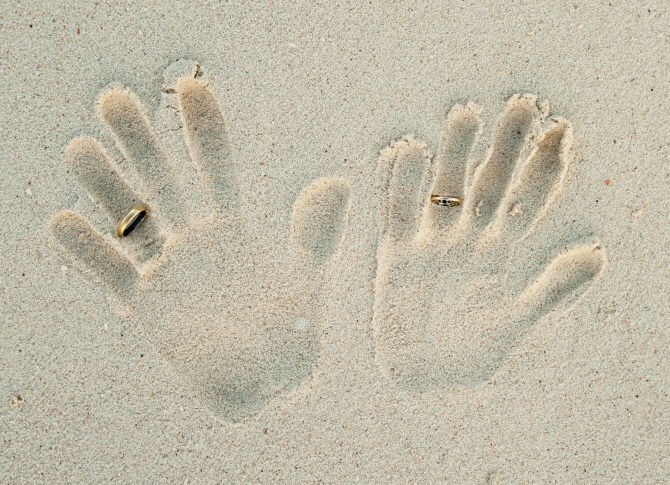 Once you come down from your honeymoon high, be sure to print your treasured memories on a beautiful wall display – available in canvas, acrylic glass or brushed aluminium.